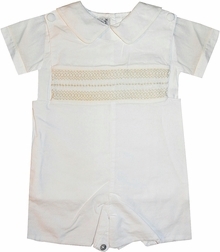 Here is a most precious white with ecru smocked "Bradley" romper by Lisa Anne for Highland Porch perfect for Christenings, ring bearers and portraits. 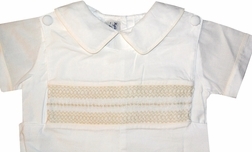 The Bradley is made with white cotton fabric and is smocked across the lower chest area and embroidered with ecru geometric patterns. 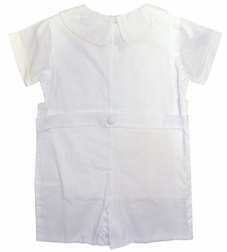 The Bradley has a button belt in the back for added elegance and is completed with a matching shirt.